Posted on November 2, 2009 at 19:11. 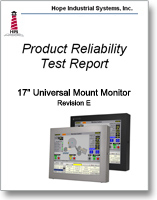 Reliability test reports for Hope Industrial Systems Universal Mount Monitors are now available on our web site. Complete test reports for our Universal Mount Monitors are available on our IEC Reliability Standards page. What kind of information is in these reports? The suite of tests included in these reports is based on the IEC 60721 Standards for products used in industrial applications. These standards specify the monitor’s ability to handle a wide range of temperature, humidity, vibration, and shock. The tests simulate the effects of these conditions while the monitor is being transported, stored, and operated. Why is Hope Industrial Systems publishing this proprietary information? One of our fundamental philosophies is to make as much information as possible available on our web site so that our customers can easily find everything they need to know about our products. Many of our customers, such as OEMs who build our monitors into their machines, need this information as part of their documentation packages. Now it is available in .pdf format for quick and easy download. For more details about IEC, a complete list of tests, and full reliability test reports, please visit our IEC Reliability Standards page.